Smart parents know that hungry kids are often unhappy kids. And most kids can probably say the same thing about their parents. Being “hangry” (a not-so-nice combination of hungry and angry) is no fun for anyone. So it’s important to keep hunger at bay on family ski days. Not only are you expending energy, but the cold weather can drain you and your kids of fuel more quickly than you might imagine. The science is fairly clear: for athletic performance everyone, adults and kids, needs a combination of carbohydrates, protein and fat. This combination provides lasting energy and helps your muscles recover more quickly. 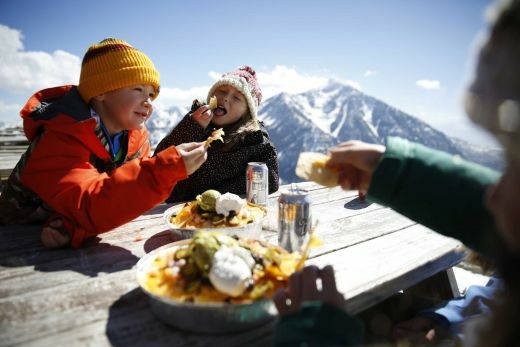 Equally important, you’ll ski better and have more fun if you’re well-fed and well-fueled. Before we talk ski snacks, let's talk breakfast. I recently read an article by a nutritionist for the Canadian Olympic Team. She suggests eating a slightly larger than normal breakfast about 2 to 3 hours before you hit the slopes. A good, balanced breakfast (she suggests steel cut oatmeal with walnuts and cinnamon) will increase your core temperature and jump start your muscles. With a solid meal on board, you’re less likely to get cold and less likely to get hurt. Having food in your stomach helps you sustain energy. Ever have that feeling while skiing that you’re simply out of gas or maybe not making turns as well as you should? Quite likely, that’s hunger and dehydration making themselves known. And while you may recognize the signs that you’re hungry and thirsty, your kids may not. That’s where snacks come in. Your kids will have a much better day, and so will you, if you’ve got snacks in your pockets, at the ready. Despite our highest hopes, the best snacks are not made of chocolate. Although there is a place for chocolate (I’ve never been one to deny that), the best snacks, just like the best breakfast, are low sugar combination of protein, carbohydrates and fat. I'm not suggesting that you must go out and purchase expensive power and energy bars or buy specialized food. Instead, here are our suggestions based on foods you probably already have in your pantry or refrigerator. Nuts: Nuts are made for skiing. They are compact, loaded with nutrition and fit nicely in your ski coat pocket. If you are inclined to indulge, they pair quite nicely with M&M’s and chocolate chips. Dried Fruit: Like nuts, dried fruit is compact, nutritious and fits nicely in one’s pocket. Combine it with nuts or chocolate and make your own trail mix. Cheese: Who doesn’t love cheese? Loaded with calcium and protein, cheese provides sustainable energy. Slice it in advance or buy individual portions. You can also make cheese sandwiches. Use whole grain bread and cut the sandwiches into bite-sized pieces for quick and easy eating. PB&J: Speaking of sandwiches, this may be a North American thing, but peanut butter and jelly sandwiches (again cut into small bites) make a fantastic snack with the right ratio of carbohydrates, protein and fat. A nice combination of salty and sweet, they’re hard to resist. Sliced Apples: Unlike other fruit, apples travel well in pockets. Slice them and soak in a bit of lemon juice to help prevent browning. Then it’s into a plastic bag for munching on the chairlift. Eggs: While eggs may not seem an obvious choice, one of my sons loves hard-boiled eggs. Peel one in advance and place it in a ziplock bag with some salt and pepper and you’ve got protein to go. Energy Balls: You can spend money on energy bars or you can make energy balls in your own home. Here’s a favorite recipe. Mix these up and store them in your freezer, one or two to a bag. Just grab and go when you’re ready to go skiing. Combine 1 cup of almonds, 1 cup of dried cherries, 1 cup of dried dates, and a dash of cinnamon in a food processor. Pulse until it forms a ball, scraping down the sides of the bowl. Use your hands to shape the mixture into small balls. Set these on wax paper and chill for an hour. Chocolate: Small pieces of chocolate make yummy snacks and treats. In addition to providing quick energy, chocolate makes a great reward for kids who are trying new things or perhaps need a bit of additional motivation. But for the most energy, you want to avoid leaning too heavily on sugary snacks. While sugar provides a quick boost, it depletes rapidly, leaving you and your kids more hungry (and possibly hangry) later in the day. Consistent hydration is just as important as good nutrition. Take time for water breaks. If you don’t like to stop skiing or riding, carry water with you. Otherwise, plan periodic breaks in the lodge to take a deep drink and warm up. Staying hydrated will help your body stay warmer and more comfortable out in the cold. Just as it's important to start your winter day off with a good breakfast, it’s also a good idea to eat a post-skiing snack within 30 minutes of coming off the hill. For this snack, you’re looking for a combination of carbs and protein to help your muscles recover. This is also the perfect excuse to take some time for après ski to recap your day with family and friends. A natural choice for everyone, children and adults, it hot chocolate. You may have heard that chocolate milk is an excellent recovery drink for cyclists. The same is true for skiers. We just like it hot and topped off with whipped cream.